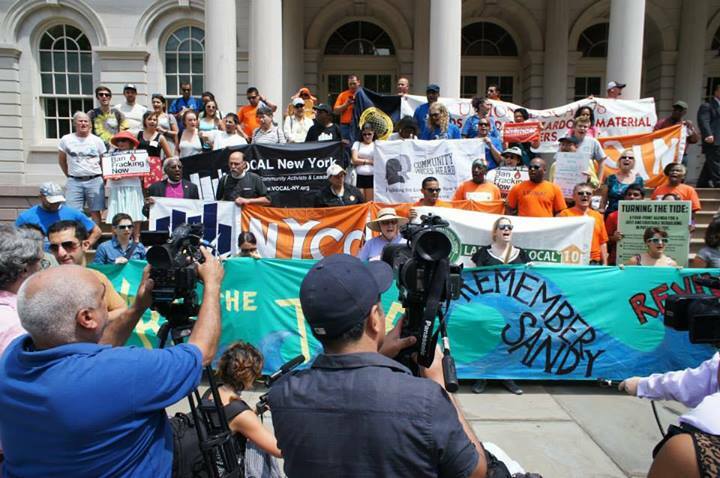 Members of the Alliance for a Justice Rebuilding at City Hall on July 31, 2013. Photo by Max Liboiron. Almost a year since Sandy ripped through New York, the media gaze has mostly shifted to other topics. But with the municipal election falling on November 3, less than a week after the Superstorm’s 29 October paper anniversary, Sandy’s aftermath and projects for reconstruction could re-emerge as a key campaign issue. But will community voices be heard? As I’ll discuss here, community groups have already laid out top priorities—for after-Sandy reconstruction and more general disaster preparedness—that warrant both voters’ and candidates’ attention. Here at the Superstorm Research Lab, we’ve made an effort to include a cross-section of voices in our research, from the people affected directly by the storm to volunteer and professional first-responders, to all manner of NGOs and institutes, to government actors. As we’ve prepared our forthcoming White Paper, we’ve seen again and again that the view from below often differs starkly from that from above. Over at our Resources HQ, we have a “Public Reports” page where visitors can download the 37 reports on Sandy that we’ve compiled so far. Of these, just four were written by community-based and grassroots organizations—the Sandy Regional Assembly (Assembly), the Alliance for a Just Rebuilding (Alliance), and Occupy Sandy New Jersey (Occupy). The Assembly’s reports are the most detailed. Its “Recovery Agenda”, released in April, outlines an impressively documented set of priorities and makes a compelling case that “low-income and communities of color be an integral part of the Sandy Recovery decision-making process.” It’s packed with tables listing existing and potential local projects alongside prospective funding sources. Its second report, a “SIRR Analysis” issued in July, evaluates Bloomberg’s Special Initiative for Rebuilding and Resiliency (SIRR) plan and makes recommendations for the federal Hurricane Sandy Rebuilding Task Force. The Assembly’s three over-arching goals are integrating regional planning with local resiliency priorities; strengthening vulnerable communities, especially with respect to public health; and expanding community-based planning on climate issues. Overall, while the Assembly agreed with a number of the mayor’s SIRR report’s concrete recommendations, the Assembly was disappointed by its neglect of “the existing vulnerabilities of environmental justice communities.” This was no surprise. The Assembly also reported with dismay that there had been minimal grassroots group input in the plan’s formulation; and there was little envisioned in SIRR’s provisions for implementation. The Alliance for a Just Rebuilding’s report “Turning the Tide” echoes themes from the Assembly reports. Its topline focus is the need for rebuilding to create local, well-paying jobs. Both reports emphasize sustainable transit—with special focus on Bus Rapid Transit, the one piece of New York’s public transit system over which the mayor has direct authority. Both also emphasize the importance of building up affordable hosing—especially, as “Turning the Tide” puts it, in places “where Sandy overwhelmingly displaced Very Low Income families”. The Alliance proposes upgrading NYCHA buildings to combined heat and power (also called cogeneration), which can cut energy costs by a third to a half. Bloomberg’s blueprint promises to make the City of New York more resilient to future disasters. But “resiliency” must apply not only to physical infrastructure, but also to economic and social infrastructure that can strengthen struggling communities and ready them for future crises. And “recovery” measures should not replicate the circumstances that made so many New Yorkers so vulnerable in the first place. Overall, we believe that the “Plan” falls short in a number of areas. It focuses on traditional “economic revitalization,” including support for tourism and small businesses, but it leaves out home-based businesses and takes no steps to build a green economy. It pays lip-service to the public health disaster caused by the storm, but offers no real public health plan and ignores mental health. It deals with housing, but focuses on property owners while leaving renters and the traditionally marginalized on the sidelines. Unfortunately, given the lack of public input throughout the recovery process, none of this is too surprising. For the shift in orientation community groups are calling for to actually take place will require leadership from above and pressure from below. Take New York. When the Bloomberg administration initially crafted PlaNYC, the city’s first big sustainability plan, it neglected to include community-based and environmental justice organizations in its key planning processes (Rosan 2011). And neither of the two panels on climate change that Bloomberg established—one on science, one on adaptation—included any representatives from these organizations either. As the mayoral election campaign heats up, let’s hope that the public engages not just with candidates’ glossy campaign literature, but also the detailed, thoughtful proposals and arguments that the region’s community-rooted organizations have put such effort into producing. Stay tuned for Part 2 of our series on Sandy and the Election on the Superstorm Research Lab blog.